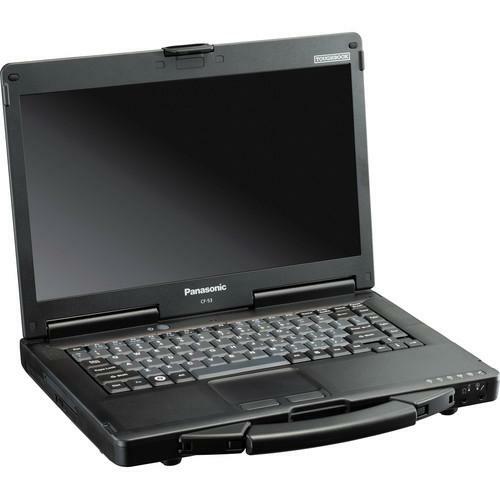 We recommend checking out our discussion threads on the Panasonic Toughbook 53 CF-532SLZACM 14" CF-532SLZACM, which address similar problems with connecting and setting up Notebooks Panasonic. The user manual for the Panasonic Toughbook 53 CF-532SLZACM 14" CF-532SLZACM provides necessary instructions for the proper use of the product Computers & Solutions - Laptops - Notebooks. Designed with outdoor mobile workers in mind, the Panasonic Toughbook CF-532SLZACM Touchscreen Notebook Computer is built to withstand shocks due to drops, inclement weather, and temperature changes in extreme environments. Encased in a magnesium alloy chassis with a built-in carry handle, the Toughbook 53 has been tested and proven to withstand drops up to 3', shock, vibration, dust, high altitudes, high/low temperatures, temperature shock, and humidity. The 14" touchscreen is built with Panasonic's CircuLumin Technology, which allows for full viewability in a wide range of lighting conditions. The widescreen display is LED-backlit, which means it brightens faster, uses less power, and provides better image quality than its CCFL counterparts. The screen has a 16:9 aspect ratio and a 1366 x 768 native resolution powered by integrated Intel HD Graphics 4400. The Toughbook CF-53 is powered by a 2.0 GHz Intel Core i5-4310U dual-core processor that can be overclocked up to 3.0 GHz. The system comes with 4GB of installed RAM, a 500GB 7200 rpm hard drive, and an SDXC flash drive slot for memory expansion. It is equipped with 802.11a/b/g/n/ac Wi-Fi, Bluetooth 4.0, and Gigabit Ethernet connectivity. 4G LTE multi-carrier mobile broadband is integrated for connecting to your cellular network. Two USB 3.0 and two USB 2.0 ports are provided for attaching peripherals, and ExpressCard/54 and Type II PC Card slots are included for inserting a memory card reader, TV tuner, or other types of expansion cards. A DVD burner is built-in, and HDMI and VGA ports are available for outputting video onto a separate display. The laptop features a number of security measures that will appeal to IT security departments, like a Kensington lock slot, TPM security, and Computrace theft protection. This system runs Windows 7 Professional by default, but includes an optional upgrade to Windows 8.1 Pro, 64-bit. If you own a Panasonic notebooks and have a user manual in electronic form, you can upload it to this website using the link on the right side of the screen. The user manual for the Panasonic Toughbook 53 CF-532SLZACM 14" CF-532SLZACM can be downloaded in .pdf format if it did not come with your new notebooks, although the seller is required to supply one. It is also quite common that customers throw out the user manual with the box, or put the CD away somewhere and then can’t find it. That’s why we and other Panasonic users keep a unique electronic library for Panasonic notebookss, where you can use our link to download the user manual for the Panasonic Toughbook 53 CF-532SLZACM 14" CF-532SLZACM. The user manual lists all of the functions of the Panasonic Toughbook 53 CF-532SLZACM 14" CF-532SLZACM, all the basic and advanced features and tells you how to use the notebooks. The manual also provides troubleshooting for common problems. Even greater detail is provided by the service manual, which is not typically shipped with the product, but which can often be downloaded from Panasonic service. If you want to help expand our database, you can upload a link to this website to download a user manual or service manual, ideally in .pdf format. These pages are created by you – users of the Panasonic Toughbook 53 CF-532SLZACM 14" CF-532SLZACM. User manuals are also available on the Panasonic website under Computers & Solutions - Laptops - Notebooks.